The late Biafran Music icon, Oliver de Coque made a popular track in one of his albums. He said, "If you are a Tenant in someone's house, don’t plant flowers because your Landlord may issue you a quit Notice any day and all you've laboured for will be a by gone. 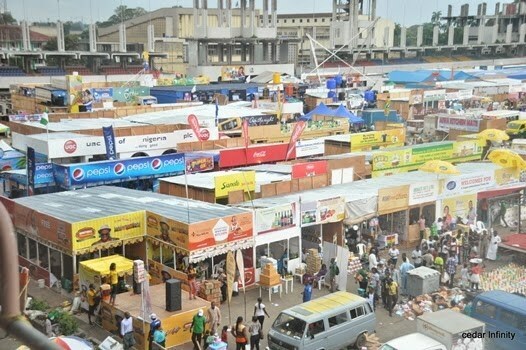 The unfolding drama regarding the Lagos Trade Fair Complex is neither sudden nor did it come as a surprise. The Lagos State Government is simply playing out a script that has been long in their plan. The Igbos should by now understand that the unity of Nigeria exists only on a piece of paper. The theory of ONE NIGERIA is to the extent of the flow of OIL from Biafra land and still serving as a Lubricant to the already week Engine called Nigeria. The Biafrans should by now understand that no matter how much they love Nigeria, Nigeria Will never reciprocate same. The recently concluded Elections where they were denied franchise in Lagos points to the ugly reality that unity and nationhood in Nigeria is for mere Lip service. Biafrans are good in contributing to the economic wellbeing of any community were they domicile. They build gigantic structures, put gold on the road, pay taxes and do everything necessary to ensure that they maintain cordial relationship with their host Communities. Unfortunately, they appear not to be learning from experience and history. They have lost properties and investment in the North. They have lost properties and investment to the Southwest and even to the South-south courtesy of the abandoned property after the 1966 Civil War. Question is, at what point will a Biafran man think home? When will they listen to the advice given to them by Revered Chukwuemeka Odimegwu Ojukwu? They have refused to understand that the Nigerian constitution doesn’t protect their investment. The Nigerian government will never protect their investments. For how long shall a people cry foul without putting on their thinking cap. I have always refused to see the Igbo man as an endangered species, but our businesses and investment are. Several times the Ikemba Nnewi of blessed memory, warned Ndi Igbo on Aku rue Ulo (Invest at Home) but nobody listened to him till he passed on. Today, the reality is staring all man at the face. The Igbo's should prepare for the worst, the time to call a spade by its rightful name, is now. The time to take a stand on Nigeria is now. Nigeria is a theatre of deception. What is happening in South West is a sign of worst evil to come and it will happen in the Northern Kano, Sokoto, Adamawa etc. It's time we see this fight as a fight to finish, we must apply all known means of Self-defence and Recovery. As a matter of urgency, we must re-evaluate our membership of this contraption called Nigeria. A situation where you are in a supposed country and you are threatened by other tribes not to vote, is enough Evil. A situation where you are in a supposed country and you cannot own Properties and do business freely and unencumbered is evil and demonic. The time for Biafrans to see things from Nnamdi Kanu's perspective is now. The time for every Biafran to rally around Mazi Nnamdi Kanu for Leadership and direction is now. The fact of the matter remains that all Nnamdi Kanu said about Biafrans and their membership of the Nigerian state is gradually unfolding. Today, we are discussing Trade Fair Complex, just one out of many. Ndi Igbo should be Proactive and not Reactive. Investment should start going home towards East, in earnest. Nigeria is not one nation and will never be one. Nnamdi Kanu is still around the corner, warning you just like Ojukwu did, about the impending Holocaust. "Osisi nuru na ana aga igbu ya, o kwuru. Mmadu nuru na ana aga igbu ya, o gbaa oso. Biafrans, what are you waiting for? The rain will soon fall with thunderstorm and lightening, the conspiracy is building up. SUPPORT IPOB CALL FOR YOUR FREEDOM! May Chukwuokike Abiama open our eyes and grant us wisdom.